Eureka Lake, home of the Ledgestone Insurance Open, is designed to punish bad throws. It’s a long course, with a lot of artificial out-of-bounds. If it sounds like a midwestern version of South Carolina’s Winthrop Gold, the venerable grounds of the United States Disc Golf Championship, it’s because it basically is. And there he was, sitting there in the Open field. The man who most recently navigated the ropes at Winthrop. A man with an eponymous playing style, coined by others, of course, that’s come to signify playing precisely and picking your moments to be aggressive. It’s not conservative, it’s not “smart,” it’s Nate Sexton golf. Starting Sunday in a tie for second with a three-stroke deficit going into the final round, would we see Sexton playing his signature style? “When don’t I?” he said after the round. 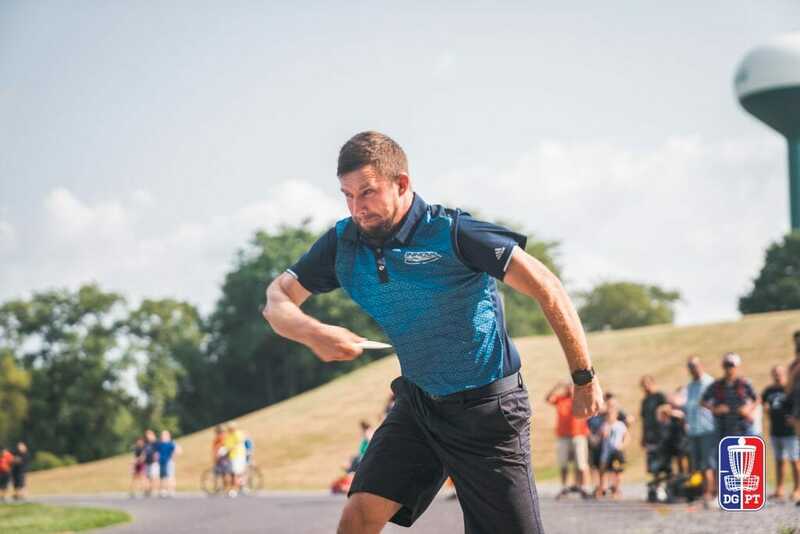 While he was able to joke later, it was all business when a disc was in his hand in Illinois. Sexton played his best golf of the weekend on Sunday, a 1064-rated, 10-under par 53, to win his first ever Disc Golf Pro Tour event with a four-round total of 28-under par 224. It took a while to get that number going. As it had been all weekend, there wasn’t much going by way of birdies for Sexton through the front nine. His 3-under par mark before the turn matched his tournament best, but more importantly, Sexton was keeping the bogeys away. His lead card mates weren’t putting the pressure on yet either. Chris Dickerson and Reid Frescura started the day in the second place tie, and neither added any distance on the scoreboard. A.J. Risley, who’d built up a lead after solid rounds Friday and Saturday, was having trouble finding birdies and would doom his chances at the win with a snowman 8 on the island hole 9, falling decidedly out of contention. Risley would go 5-under on the back nine to finish even par 63 for the final round, and sixth for the tournament at 21-under par 231. From the third card, it was Cameron Colglazier who was setting the pace. Starting the round behind seven, he’d made up six of those strokes during his front nine and took the lead into the clubhouse at 25-under par 227 after shooting the hot round 11-under par 52. There was no need for alarm from the top card, though, as the holes in hand offered a litany of scoring chances. Quickly too it became a two-horse race to catch Colglazier between Sexton and Dickerson. Both added four birdies in five chances to start the backstretch and had tied for the lead by hole 14. There was only one thing on the players’ minds at that point. A birdie each for Sexton and Dickerson on 15 meant there were two new leaders. First to tee on the par 4 hole 16 was Dickerson. He stepped up with a forehand placement shot that found nothing but trouble after reacting off the ground, heading directly toward the left side gallery OB. Sexton was safe, sticking his forehand center cut on the fairway. If not for a delicious scramble from Dickerson and another Circle 2 step-putt, this time to save par, it could have been the win there. Sexton birdied to go up one. The island hole 17 went off without incident which left just the one stroke difference on hole 18. Sexton up first put down a backhand roller that curled its way to a prime placement near the concrete overlook about midway up the fairway. Dickerson found a way to skip past Sexton with an air shot for a similarly good look at the basket. And then, what Sexton called his best shot of the round. “To keep the pressure on,” he said. The forehand approach from Sexton took a line toward the water before hooking up inside the circle, skipping cage high and just to the side of the basket. Maybe a foot away from a walk-off eagle. It would settle about 30 feet away for a comebacker. From nearly the same position, Dickerson also goes forehand approach, his a bit sawed off hitting short further up the hill. But instead of a Circle 2 death putt to force Sexton to convert his birdie look, Dickerson’s disc stands up and starts a slow roll towards the water, where it would eventually come to rest. In style reminiscent of last season’s USDGC win, Sexton laid up his inside the circle putt, his only “missed” Circle 1 putt of the round, to tap in par for the win. So after a mini-tour break and winning his first tournament back, Sexton “feels great” having defeated one of the tour’s most demanding courses. Sexton finished the weekend first in scramble rate (85-percent), second in fairway hits (86-percent), and sixth in Circle 1 putting (96-percent) according to UDisc Live. Dickerson took home solo second with a 26-under par 226 total. Colglazier was third. Providing some final round excitement with up-and-down performances were Paul McBeth shooting an 11-under par 52 to finish 13th, and Ricky Wysocki, James Conrad and Drew Gibson matching Sexton’s 10-under par 53 final round. They finished 8th, 11th and 20th respectively. Comments on "Ledgestone No Match For Sexton’s Might"